Figure 1: Letter from Peter Regis to Garner J. Cline, in 1979, regarding the overflow of Soviet Jew refugees in Rome. One of the hot topics in today’s political climate is the refugee crisis. On January 27, 2017, President Donald Trump issued an executive order banning refugees from Muslim countries from entering the US for 90 days, and suspended the US refugee programme for 120 days. This contentious national issue is nothing new. In fact, the banning of refugees can be traced back through US history. When it comes to immigration, Americans often fixate on the problems that accompany it such as a decrease in jobs. However, as is in accordance with SJU’s Vincentian perspective on social justice, it is my belief, and HIAS’s, that the right to refuge is a universal human right. Going through the manuscripts in the Garner J. Cline Papers collection at the Center for Migration Studies, I was captivated by one manuscript. It was a letter, dated March 6, 1979, to Cline from Peter Regis. Cline was staff director of the Judiciary Committee at the time. In this letter, Regis, a legislative assistant on the Subcommittee on Immigration, Refugees, and International Law, discusses the issue of the Soviet Jew refugee build-up in Rome. 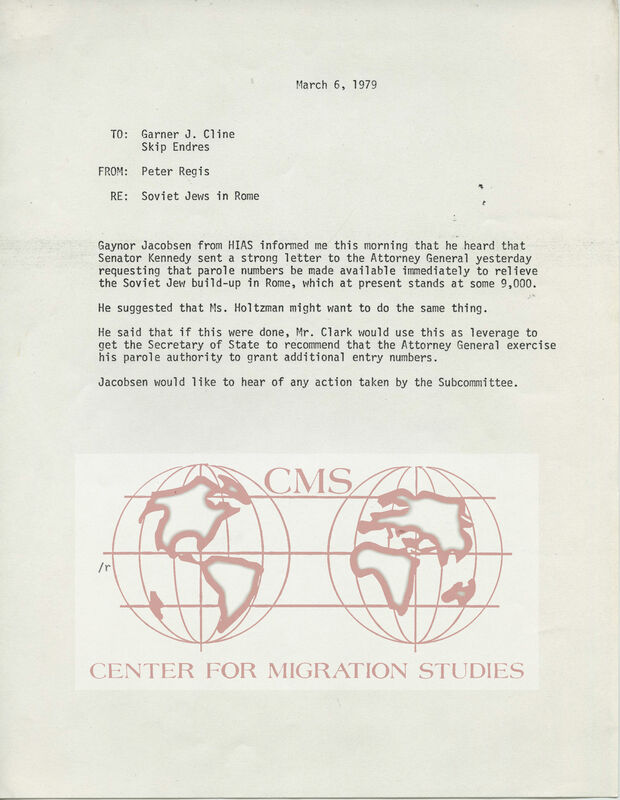 According to Regis, Gaynor Jacobson, executive director of United HIAS Service, heard from Senator Kennedy that he had sent a letter to the Attorney General requesting parole numbers be made available to the Soviet Jew refugees in Rome. Regis further urges Elizabeth Holtzman, chair of the House Subcommittee on Immigration, Refugees, and International Law, to do the same. This he says will allow Mr. Clark to appeal to the Secretary of State, Cyrus Vance, to recommend to the Attorney General, Griffin Bell, to exercise his parole authority to grant additional entry numbers for Soviet Jew refugees. Presumably, Mr. Clark refers to Ramsey Clark, former Attorney General. During this time in American history, refugees from the Soviet Union were fleeing religious persecution. Despite Jews being officially classified as a nationality, Soviet authorities strongly discouraged religious observances. The issue in Rome involved more immigrants entering the country than could be processed by HIAS, and not enough paroles being made available fast enough. Cline was an advocate for America welcoming the Soviet Jews. He believed in HIAS’s mission that seeking refuge is a universal human right. Because of his efforts and the Refugee Act of 1980, which defined refugees as anyone outside his or her country as a result of persecution, Soviet Jews were given refugee in the US until issues arose in the late 1980’s. As a student at SJU and a believer of the Vincentian perspective of social justice, this manuscript exemplifies why we must continue fighting for this human right. How can we, in good conscience, turn our backs on people who are trying to escape presentation and call ourselves a nation of freedom? Cline fought for this right for the Soviet Jews, now we must remember that and fight for the current refugees in Muslim countries. Singhiv, Anjali, and Alicia Parlapiano. “Trump’s Immigration Ban: Who Is Barred and Who Is Not.”The New York Times, February 3, 2017. Accessed March 3 , 2017. https://www.nytimes.com/interactive/2017/01/31/us/politics/trump-immigration-ban-groups.html?_r=0. “History,” HIAS, 2017, accessed March 3, 2017, https://www.hias.org/history. “Garner J. Cline, 63,” The Morning Call, November 19, 1990, , accessed March 3, 2017, http://articles.mcall.com/1990-11-19/news/2770196_1_cline-garner-easton. “Committee on the Judiciary .” Accessed March 3, 2017. http://njlaw.rutgers.edu/collections/gdoc/hearings/8/82601601/82601601-0002.pdf. “Gaynor Jacobson Appointed Executive Director of United Hias Service.”JTA, 109th ser., 33, no. 49 (June 9, 1966): 1-4. Accessed March 3, 2017. doi:http://pdfs.jta.org/1966/1966-06-09_109.pdf. Lederhendler, Eli. “Elizabeth Holtzman.”Jewish Women’s Archive.March 20, 2009. Accessed March 3, 2017. https://jwa.org/encyclopedia/article/holtzman-elizabeth. “Cabinet Officers in the Carter Administration.” Jimmy Carter Presidential Library and Museum. April 28, 2016. Accessed March 3, 2017. https://www.jimmycarterlibrary.gov/documents/jec/cabinet.phtml. Maclean, John. “Two Envoys Halted U.S. is ‘Hopeful’ on Iran.”The Chicago Tribune(Chicago), November 8, 1979, 312th ed., sec. 1. Accessed March 3, 2017. http://archives.chicagotribune.com/1979/11/08/page/1/article/khomeini-rejects-carters-envoys. “Soviet Jews in San Francisco.” Stanford University Libraries. Accessed March 3, 2017. https://library.stanford.edu/spc/exhibitspublications/past-exhibits/soviet-jews-san-francisco. Gilbert, Sari. “Emigrant Soviet Jews Mark Time In Italy Awaiting Chance to Move On.”The Washington Post(Washington D.C.), August 3, 1979. Accessed March 3, 2017. https://www.washingtonpost.com/archive/politics/1979/08/03/emigrant-soviet-jews-mark-time-in-italy-awaiting-chance-to-move-on/490aa32e-49eb-473f-8816-9ae4f723e07f/?utm_term=.7c45ce49ffcc. Lazin, Fred A. “Refugee Resettlement and ‘Freedom of Choice’: The Case of Soviet Jewry.” Center for Immigration Studies. July 2005. Accessed March 3, 2017. http://cis.org/RefugeeResettlement-SovietJewry. “Cabinet Officers in the Carter Administration.” Jimmy Carter Presidential Library and Museum. April 28, 2016. Accessed 3 March 2017. https://www.jimmycarterlibrary.gov/documents/jec/cabinet.phtml. “Committee on the Judiciary .” Accessed 3 March 2017. http://njlaw.rutgers.edu/collections/gdoc/hearings/8/82601601/82601601-0002.pdf. “Garner J. Cline, 63,” The Morning Call, November 19, 1990, Accessed 3 March 2017, http://articles.mcall.com/1990-11-19/news/2770196_1_cline-garner-easton. “Gaynor Jacobson Appointed Executive Director of United Hias Service.” JTA, 109th ser., 33, no. 49 (June 9, 1966): 1-4. Accessed 3 March 2017.doi:http://pdfs.jta.org/1966/1966-06-09_109.pdf. Gilbert, Sari. “Emigrant Soviet Jews Mark Time In Italy Awaiting Chance to Move On.”The Washington Post(Washington D.C.), August 3, 1979. Accessed 3 March 2017. https://www.washingtonpost.com/archive/politics/1979/08/03/emigrant-soviet-jews-mark-time-in-italy-awaiting-chance-to-move-on/490aa32e-49eb-473f-8816-9ae4f723e07f/?utm_term=.7c45ce49ffcc. Lazin, Fred A. “Refugee Resettlement and ‘Freedom of Choice’: The Case of Soviet Jewry.” Center for Immigration Studies. July 2005. Accessed 3 March 2017. http://cis.org/RefugeeResettlement-SovietJewry. Lederhendler, Eli. “Elizabeth Holtzman.”Jewish Women’s Archive.March 20, 2009. Accessed 3 March 2017. https://jwa.org/encyclopedia/article/holtzman-elizabeth. Maclean, John. “Two Envoys Halted U.S. is ‘Hopeful’ on Iran.”The Chicago Tribune(Chicago), November 8, 1979, 312th ed., sec. 1. Accessed 3 March 2017. http://archives.chicagotribune.com/1979/11/08/page/1/article/khomeini-rejects-carters-envoys. Singhiv, Anjali, and Alicia Parlapiano. “Trump’s Immigration Ban: Who Is Barred and Who Is Not.”The New York Times, February 3, 2017. Accessed 3 March 2017. https://www.nytimes.com/interactive/2017/01/31/us/politics/trump-immigration-ban-groups.html?r=0. “Soviet Jews in San Francisco.” Stanford University Libraries. Accessed 3 March 2017. https://library.stanford.edu/spc/exhibitspublications/past-exhibits/soviet-jews-san-francisco. This entry was posted in Center for Migration Studies (NY) and tagged Center for Migration Studies, Garner J. Cline, Immigration, Immigration reform, Italy, Refugees, Soviet Jews. Bookmark the permalink.